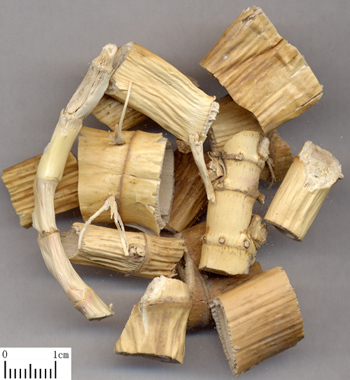 The rhizome of perennial herbaceous plant gramineae-Phragmites communis (L. ) Trin. Spade and collect at the end of spring, beginning of summer or in autumn. Not smelly and sweet in taste. Thickset strip and big in white-yellowish color and luster without fibrous root. It is light with tenacious texture, not easy to be snapped. Unprocessed, especially the fresh one. Sweet and cold; lung and stomach meridians entered. Clear heat and generate fluids, clear stomach heat and stop vomiting, clear lung heat and expel phlegm, discharge pus, induce diuresis. It is effective for clearing heat at qi system. For heat pathogens entering qi system, manifested as high fever, sweat, irritable thirst, it has the actions of dispelling heat, stopping irritability and quenching thirst. Because of its mild actions, it is only used as an assistant herb to Shi Gao and Zhi Mu. For thirst with irritability due to heat consuming fluids, it is commonly used and often combined with yin-nourishing and fluids-generating herbs because it can clear stomach heat and generate fluids. For instance, in Wu Zhi Yin from Wen Bing Tiao Bian, it is combined with Mai Dong juice, Lotus Root juice, pear juice, etc. For common cold due to win-heat with pathogens at defense system manifested as thirst with irritability, it is often combined with exterior-releasing herbs and wind-heat-dispelling herbs for it can generate fluids to quench thirst while not retain pathogen internally. For instance, in Yin Qiao San and Sang Ju Yin, it is combined with Jin Yin Hua and Sang Ye. It can clear and purge stomach heat and promote fluids generation to quench thirst, and harmonize stomach to arrest vomiting, it is indicated for thirst and polydipsia caused by stomach heat consuming body fluids and for vomiting caused by adverse rising of stomach heat. For thirst, it is often combined with herbs for clearing stomach heat and generating fluids. For instance, it is usually combined with Tian Hua Fen, Zhi Mu in Xie Re Lu Gen San from Sheng Hui Fang ( Holy Benevolent Prescriptions). For vomiting and nausea due to stomach heat, it can be used alone by taking thick decoction frequently; a better effect can be achieved if combined with heat-clearing and vomiting-arresting herbs. For instance, in Lu Gen Yin Zi from Qian Jin Fang (Invaluable Prescriptions for Emergencies), it is combined with Zhu Ru, etc. It can clear lung heat and has certain actions of dispelling sputum and draining pus. For cough with sticky yellow sputum due to lung heat or phlegm heat, it is usually combined with herbs for clearing heat and resolving phlegm such as Huang Qin, Gua Lou, Zhe Bei Mu, etc. For cough with purulent sputum due to lung abscess, it is often combined with herbs for clearing lung and promoting pus discharge such as Yu Xing Cao, Yi Yi Ren and Dong Gua Ren. Decoct 15~30g, or take 30~60g of the fresh one, or smash it and take the juice.